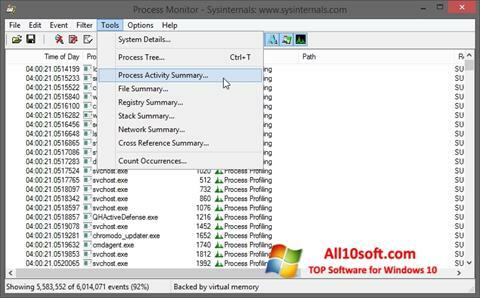 Process Monitor for Windows 10 - A tool from Microsoft, which displays statistics about all running processes. Special attention is paid to programs accessing the hard disk and registry. The user can get information about starting and ending processes, loading DLLs, device drivers. Installation of filters is available, there is a view of the tree structure of the main and dependent processes, the output of extended information about each of them, and events. When the operating system is loaded, a special log is kept that records the launch of all operations. You can free download Process Monitor official latest version for Windows 10 in English.